The Oral-B Pro 3000 is one of the best mid-level toothbrushes you can buy. It comes packed with features that not only make it easy to use but also deliver an exceptional cleaning performance. 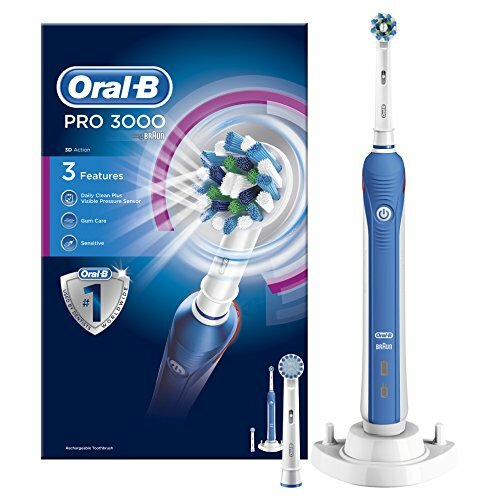 If you are looking for a mid-range Oral B toothbrush, the Pro 3000 is a great buy. It carries some of the best features and tech of the Oral-B Pro series at an affordable cost. These include a specially shaped toothbrush head, a 3D cleaning action, a timer and a pressure sensor. A built-in timer helps you give enough attention to each section of your teeth while three cleaning modes ensure that all your dental cleaning needs are taken care of. See the full features of this great electric toothbrush below below. Most electric toothbrushes move in only one or two directions. The Oral-B Pro 3000 has 3D movement which provides a higher degree of cleaning performance. By 3D we simply mean that it oscillates side to side, pulsates back and forth and also rotates. The 3D cleaning action ensures that no plaque is left behind. The brush can also help reduce the appearance of tobacco and coffee stains on your teeth. The Pro 3000 doesn’t even begin to compare with the performance of a manual brush. Your teeth will be whiter and cleaner within the first week or two. Daily clean – this is the basic everyday cleaning mode. It’s ideal for most people. Gum care – in this mode, the brush gently stimulates the gums which helps boost blood flow and improves their resistance to infections and other dental problems. Sensitive – This mode reduces the speed of the brush head for a gentler cleaning action. It is ideal for those with sensitive teeth and gums. Brushing your teeth excessively hard does not make them cleaner. In fact, it could cause damage to your teeth and gums over time. This is a mistake a lot of people make with manual toothbrushes. The Pro 3000 comes with a pressure sensor to prevent you from applying too much pressure on your teeth and gums. The light indicator for the sensor is located right at the top of the head where you can see it easily when brushing. If you apply too much pressure the light will not only come on, the sensor will also stop the pulsations to make sure you adjust the amount of force you are using. Unlike the rectangular heads you are used to in manual and most electric toothbrushes, the Pro 3000 features a specialised round brush head. How different is it from the other ones? The round head is designed to cover one tooth at a time, providing dedicated cleaning as you go from tooth to tooth. Furthermore, the bristles are slightly angled to allow them to penetrate deep between your teeth and remove any stuck plaque and gunk. Finally the Pro 3000 comes with a built-in timer located on the handle. It buzzes every 30 seconds to alert you that it’s time to move to the next quadrant. After 2 minutes – the recommended minimum cleaning time – it will also alert you that you are done. It might take some time to learn how to switch to different speeds but most people had figured it out in a couple of days. When you press the power button it switches on at the highest speed. Pressing it again reduces the speed (sensitive mode) and pressing it for the third time sets an intermittent speed (gum care). Other than that the toothbrush is very easy to use. It ships with a UK 2 pin plug for charging. There are no accessories provided along with the toothbrush nor do you need to buy any. No accessories such as a travel pouch are included. If you are travelling you don’t have to carry the plug with you. When fully charged, the Pro 3000 can easily last a full week when you brush twice a day. This is shorter than the 2-week battery life of the Philips Sonicare toothbrushes but still long enough to last most camping or business trips.